Have you ever needed a specific article or book but couldn’t find it? Don’t despair. The Marriott Library’s Interlibrary Loan & Document Delivery Department can get it for you. And what’s more, during Get it, Got it, Good! 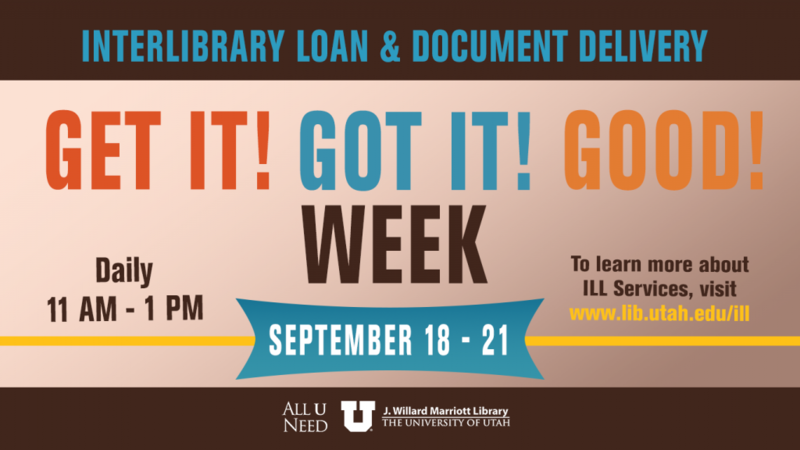 Week, happening Sept. 18-21, students can stop by our tabling sessions to register for Interlibrary Loan & Document Delivery and have some fun at the same time. A free service, Interlibrary Loan provides students with books and articles by borrowing them from other libraries. Document Delivery staff will scan and deliver journal articles and book chapters that are owned by the Marriott Library. “Our library offers a large number of collections, but when students need something that is not listed in our catalog, they can request it through Interlibrary Loan and we can get if for them,” explains Susan Brusik, manager of Interlibrary Loan & Document Delivery. The best part? In most instances articles can be provided within 24-48 hours and books are available within one to two weeks. Who wants to search the stacks when you can simply request the item? Document delivery staff will scan and deliver journal articles and book chapters that are owned by the Marriott Library. “We find Document delivery to be a popular service with students because it really saves them time,” explains Brusik. So how do I sign up for Interlibrary Loan & Document Delivery you ask? Simply stop by during Get it, Got it, Good Week to sign up in person and receive free food and other goodies. You can also register through on the Interlibrary Loan page. Have questions? Come see us at one of the events listed above or check out our FAQ.